The Innovative Factory Systems (IFS) research department at DFKI, headed by Prof. Dr. Martin Ruskowski, deals with issues surrounding Industrie 4.0 and the factory of the future. We develop scientific approaches and new concepts in research and industry projects before moving on to practical testing in an industrial environment. In many cases, the research results are transferred for implementation by SmartFactoryKL and its members from industry. The close collaboration between DFKI and SmartFactoryKL is a major key to our success. How are the units, modules, and control terminals automated and networked in an Industrie 4.0 environment? The Technologie-Initiative SmartFactory KL e.V., founded in 2005 as a non-profit association, is an Industrie 4.0 network of industrial and research partners who jointly carry out projects regarding the factory of the future. SmartFactoryKL is a manufacturer-independent demonstration and research platform which is unique in the world. Here, innovative information and communications technologies and their application are tested and developed in a realistic, industrial production environment. The technology initiative, supported by the active participation of its members, has already established pragmatic solutions, first products and common standards. 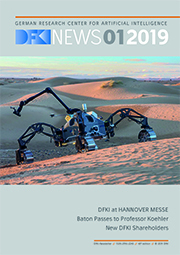 SmartFactoryKL intensively cooperates with the German Research Center for Artificial Intelligence (DFKI) in Kaiserslautern. Both were appointed Mittelstand 4.0-Kompetenzzentrum Kaiserslautern (SME 4.0 Competence Center) by the German Federal Ministry for Economic Affairs and Energy in 2016.